This entry was posted on April 6, 2013 by Tinteán Editorial Team/EMcK, in Features, History. Bookmark the permalink. The terms ‘Irish’ and ‘Catholic’ are usually, but not always, interchangeable. There was for example tension between the two during the Home Rule period, when Archbishop Carr feared to endorse visiting Irish Home Rule delegates. Nor was the Irish Catholic community as monochrome as its label suggests – Catholic emigrants from other races (for example Italians, Lebanese Maronites, and Gaelic-speaking Scots Highland Catholics) usually married into the Irish Catholic community, as they had Catholicism in common. Mother (now Saint) Mary MacKillop came from Scots Gaelic Catholic community. I am not considering the Protestant Irish group of lawyers and squatters, some of whom supported Catholic emancipation and Home Rule. Nor am I considering English Catholics, who were prominent early on at Port Phillip. The country Irish had the same profile as the Melbourne Irish; their main strongholds were at Port Fairy, Kilmore, Pakenham and Ballarat (the cockies of Bungaree). Many country Irish moved to Melbourne, especially during the 1890s depression, and as a result many Melbourne Irish Catholic families have a rural connection – they’re not really two separate communities. The nineteenth century Irish of Victoria came mainly from the province of Munster in Ireland’s south-west (Tipperary, Cork, Clare, Limerick and Kerry,) and from the midland counties. Victoria’s Irish were in the main young adults, rural, landless, uneducated and unskilled, and single in two senses – unmarried, and arriving as individuals more than as family groups. But some came as cousinage and locality groups, and mixed here with what they called their ‘townies’ – people from their own townlands in Ireland. The Irish were the only immigrant group who had a high proportion of women among them, a very important factor, as we’ll see later. The 1860s to 1890s was the biggest period of Irish immigration, with push factors in Ireland caused by land ownership shortages coinciding with pull factors in Victoria with the long boom after the gold rushes. The outlook of Irish Australians differed in a number of ways from their American counterparts. The long voyage out meant a permanent psychological as well as physical break from Ireland. They had little chance of returning and were less passionate about the troubles of the Old World they had left behind. Coming a generation after the Famine, those who came to Australia were working class and some even lower middle class rather than the utterly destitute of the previous generation. Their memories of Ireland were, as a consequence, less bitter about England than those who had left earlier for the US. Moreover the Irish here lived under British rule, and so were less likely to develop an anti-British worldview than those in the independent United States. These factors combined to lead the Australian Irish to be more temperate in their subsequent political affiliations, and more moderate than Dr Mannix, which was to cause problems for him – and for them – in Melbourne. For a number of reasons Melbourne became the focal point in Australia of consciousness of being Irish Australian, and of consciousness of the wrongs of old Ireland. The publisher of the Catholic paper, The Advocate, Joseph Winter, was for decades a relentless propagandist for Home Rule, as were the Home Rule activists Dr Nicholas O’Donnell, leading Gaelic scholar and intellectual, and the organizer Morgan Jageurs. They controlled all the big Home Rule organizations from the 1880s onwards. Victoria had three early influential Irish Catholic Premiers – Sir John O’Shanassy, Sir Charles Gavan Duffy and Sir Bryan O’Loghlen – who were generally accepted by the broader non-irish Catholic community. Then there was the dominance in Melbourne of the Irish Christian Brothers, formed in the penal days in Ireland to educate hedge children, who were carriers and incubators of anti-British Irish nationalism wherever they went. Mannix’s arrival in Australia was therefore not entirely random and fortuitous in time and place. He came to the city in Australia most conscious of its Irish heritage. And in time he came just before the Home Rule Bill of 1914 was passed and postponed, and the Easter Rebellion in 1916, when Irish events began for the first time to play a role in Australian public affairs. Because they were moderate politically, Melbourne’s Home Rulers eventually got run over by history; they clung through thick and thin to the Redmond line, believing Britain would grant Ireland self-government. The Redmond brothers had visited Melbourne as Home Rule delegates, they had married Sydney sisters, so Australian Home Rulers felt attached to them personally. When Sinn Fein triumphed in the 1918 elections, Melbourne’s Home Rulers were cornered. For three decades they had been ostracised as dangerous Fenians by the Melbourne establishment. After suffering for being extremists, they suddenly suffered for being too conservative on Irish issues. They now had an Archbishop, Mannix, who outflanked them on the left, whereas Archbishop Carr had been on their right. The numerous Melbourne Catholic clerical and lay elite, moderate Home Rule supporters, all differed from Mannix, except for the politician Frank Brennan and Fr J.J. Malone. Mannix therefore had to form a new alliance, over the heads of the Catholic elite, between himself and ordinary Melbourne Catholics, who applauded his speeches. The most prominent Catholic layman, Dr Leo Kenny, differed with Mannix on conscription and Ireland. Morgan Jageurs, head of the Home Rule body, wrote to the High Court Justice, the Irish Protestant Henry Bournes Higgins, of ‘the sinister and powerful influence of Dr Mannix.’ The convert Benjamin Hoare of The Age was an outright opponent. Previously the emphasis by historians has been on the intense public squabbles Mannix, leading a Catholic phalanx, had with the Prime Minister Billy Hughes and the conscriptionists. But there were just as many squabbles inside the Catholic community. So the picture of Mannix leading a united Catholic flock needs to be modified. How many people realize that Tom Brennan, editor of the leading Catholic paper The Advocate, supported conscription during the first referendum? Australia’s Home Rulers had almost no experience of contemporary Ireland. As a consequence they saw it through the romantic lens of its past cultural glories – a great civilisation of saints and scholars – rather than looking at its present economic deficiencies, as Mannix had done at Maynooth. He said in a speech in 1917: ‘During the years through which we have been waiting, Ireland has been depopulated; her harbours have been emptied; her trade has been ruined; her people have been scattered; drip by drip her life-blood has been ebbing away.’ He was more in touch with contemporary Irish realities. Two Victorian Irish Catholics made a mark on the world stage. James Hogan wrote the first history of the Irish in Australia. A fellow reporter, Alfred Deakin, described him in the 1880s as ‘an able and industrious journalist, never without a book, and always likely to be run over by a tram’. Hogan got himself elected as an Irish member at Westminster, where his main theme during the second Home Rule debate was that after less than 20 years of European settlement, Victoria had been given self-government, that is Home Rule, by Britain, but Ireland, a distinguished European nation for at least 1500 years, was being denied it. Arthur Lynch from Ballarat had a father who was a Eureka rebel. Arthur led an Irish Brigade for President Kruger against the British in the Boer War. He also got himself elected to Westminster as an Irish member but, as he was about to take his seat, he was arrested for treason and sentenced to death. After much public protest this was commuted to life imprisonment and he was freed after five years by the King, after which he took up a Westminster seat for another decade. Where did the Melbourne Irish live? Many of the immigrant Irish moved to North Melbourne, then called Hotham or West Melbourne, to work. They were rural people in the livestock and transport industries centred on the Newmarket sale yards, the old North Melbourne wholesale meat market (the shinboners), the abattoirs on the Maribyrnong River, the Spencer Street railway station, Kirk’s horse bazaar, the Flemington racecourse and the Harbour Trust. Later this North Melbourne group moved out to settle in the suburbs to the north-west of the city stretching from Flemington to Essendon and beyond; others moved to Brunswick and Coburg, and another group west to Footscray. The Richmond flats near the Chapel Street bridge were known in the early days as a working class Irish domain. Another Catholic area of influence began at the St Kilda parish on Dandenong Rd, with the St Kilda Christian Brothers College and Presentation Convent Windsor close by. This Catholic area stretched south to Elsternwick, Gardenvale and Brighton, with two racecourses at Epsom and Mentone, which attracted the Irish, and more Catholic schools and convents. The dry belt from Kew to Camberwell and Glen Iris had a lower Catholic population, but had virtually all the Catholic secondary schools, as that was where wealthier Catholics lived. Catholics were strong in certain government departments, like the police, railways and legal departments. [In 1879] Catholic education defence associations were established, with the Archbishop’s approval, in every parish throughout the length and breadth of the land. Never before had the Catholic vote been so skilfully and systematically organized. The priest in every parish was president of the local association; constituencies were mapped out and canvassed and every possible Catholic name was added to the electoral rolls. But it never worked, as the Catholic vote was diffused. In the 1940s and 1950s of my memory, we went about our daily tasks mixing with others, but our cast of mind was quite different, and it dominated us with an extraordinary intensity. Every aspect of life was covered by this religious worldview. For example, attitudes to money were determined by moral, rather than hard-headed business, precepts. It was shameful, we were told, to go into debt, but even worse to accumulate riches – remember the rich man and the eye of the needle. Many Catholic families had an old State Savings Bank deposit book, with very little in it. We learnt music through Gregorian chant and sung masses, we learnt the history of Europe through accumulated church rituals and customs as much as from the explicitly Catholic view of history we were taught, we absorbed Latin, Roman history and a general church admiration of ‘Romanitas’ in all endeavours, we were taught thought structures through Augustinian and Thomist theology, which produced our own version of philosophical thinking. In Australia, a new and raw country where civilization wasn’t in the air you breathed, and had to be consciously learned, the four major Christian religions – Anglican, Presbyterian, Catholic and Evangelical (plus of course the Jews) – were among the principal culture-bearing institutions of society. In addition to their strictly religious functions, one imperceptibly and unconsciously imbibed through their rituals, schools and social organizations the history of European manners and customs. In the earlier decades of the 19th century, the overall population, including Catholics, was much more jumbled. Relationships were much freer in Australia than in the old world, and mixing with strangers much more common. A general shortage of women – the diggers were largely single males – meant men often had to look outside their own religious group for partners. Amazingly half of the Irish Catholic women who married in the 1850s gold rush decade in Australia married non-Catholics. This melting pot atmosphere gives the supposedly Irish Catholic activists an unexpected breadth, influences their outlook, and throws into contention just what the phrases like ‘Irish Australian’ or ‘Irish Catholic’ meant in Australia – these monochrome terms mask a more diverse background. 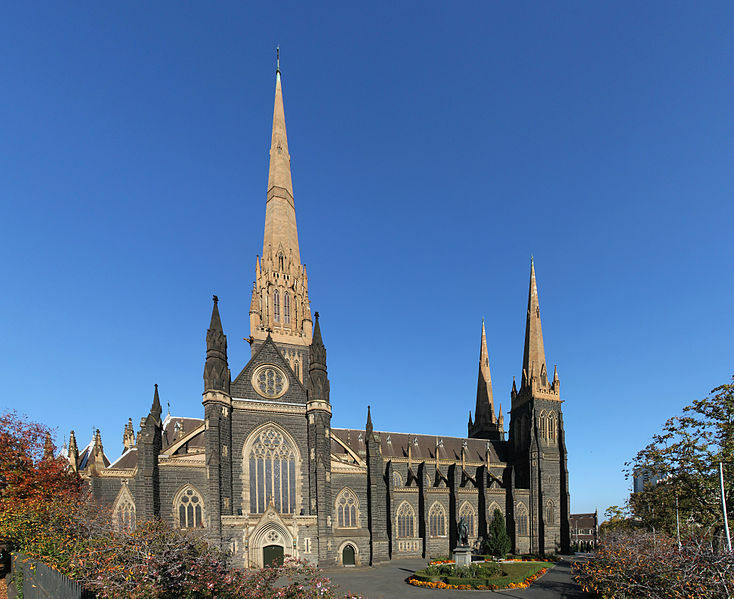 It was only late in the 19th century that the large group called ‘Irish Australian Catholics’ consolidated itself, when people began to settle in the big cities, when there was a larger marrying pool within one’s own group, when an increase in religious bigotry made Catholics huddle together to deflect the flames of sectarian scorn, and when the Catholic Church began to enforce its dislike of mixed marriages. For all these reasons the large Irish Catholic group came into existence. These large Irish Catholic families constituted an extended cousinage group, based on relationships and friendships even more than on parishes or workplaces, so close that some people were called Aunty or Uncle when they weren’t actually so. People were placed by their family background, giving their situation an equilibrium – you felt secure and at home. In the Jesuit Fr Bourke’s history of Melbourne’s oldest and biggest family clan, the Pakenham Bourkes, he writes: ‘My cousin and friend Judge Arthur Adams says that I am fanatically attached to my family’ – well, no, for a Melbourne Catholic he was just normally attached. Everyone’s head was full of family ramifications. My uncle Fr Richard Morgan, like Fr Bourke a Jesuit, documented 400 relatives in Ireland and 400 in Australia in our family. The Livingston history of my wife’s family totals more than 800 pages. Colloquially the Irish Catholic community was known as the ‘Green Machine’, a description accurate only if the machine was so well oiled, silent and automatic that you didn’t know it was a machine, and it didn’t operate like one. It was more a whispering gallery, a network of elevated gossip. This community was spontaneous, social, familial, and recreational. It was not organized for religious, commercial or political ends. It was not a mafia nor a Tammany Hall operation, until the Movement and the DLP came along, damaging its original and essentially social form, as the Irish Catholic community was now conscripted for other (political) ends. The Irish Catholic sub-culture would have gradually and naturally diluted, since Catholics had started marrying out from the 1960s onwards. But the tragedy of The Split tore Catholic families apart, and brought the long standing Irish Catholic community, as we had known it, to a shattering, abrupt and premature end. One result of 50% of Irish women marrying out during the goldfields decade was that the existence of many Irish Catholic families since has been obscured by a non-Irish surname. My wife Ann’s family is an example. A Presbyterian Scot named George Livingston from the Scots highlands and islands came to the Maldon goldfields in the 1850s. In 1860 in Castlemaine he married Brigid O’Donnell – after that virtually all subsequent people in this enormous family, which moved to North Melbourne from the country, were Irish Catholics, but hidden by the Scots surname. There are many Irish Catholic families of this kind. Conversely many non-Catholic families have a grandmother or a great grandmother who was Irish Catholic from an earlier period, whether acknowledged, or hidden, or forgotten by the family in subsequent generations. There is another Hidden Ireland. What did the following major novelists from Victoria in the 19th & 20th centuries – with the exception of Marcus Clarke – have in common? Rolf Boldrewood, Joseph Furphy, Norman Lindsay, H.H. Richardson, Mary Grant Bruce, Martin Boyd, Vance Palmer and K.S. Prichard. They all came from Protestant Irish families, the last two on the maternal side, all the others on the father’s side; in addition Mary Grant Bruce and Vance Palmer (wife Nettie Higgins) married into the Protestant Irish group, but as novelists they wrote little on Ireland. Rolf Boldrewood was the daddy of them all. He joined the Melbourne Club when it began in the late 1830s. When he died he was revered as almost its oldest continuous member, who presented himself as a distinguished Anglophile gentleman. It was said he was not really Rolf Boldrewood. In real life he was Thomas Alexander Browne, Browne with a final ‘e’. He was nothing of the sort! His father was Sylvester O’Flaherty, illegitimate son of a Galway doctor William O’Flaherty, himself a sort of Regency rake before his time. Sylvester O’Flaherty’s mother was a common garden Brown without the ‘e’. Rolf was most likely himself the illegitimate son of Sylvester O’Flaherty, by now styling himself Sylvester Brown. This is hardly Melbourne Club material. If Rolf had rolled up to the club door as an O’Flaherty, they might have had a second look. O’Flaherty is one of those surnames whose origins are a little difficult to disguise. At some stage he family changed their name to Browne with an ‘e’, that being a distinguished Anglo-Irish family in the west of Ireland, they burnt the family papers and devised a family genealogy. Boldrewood died in 1915 – all this was hidden by the family until the year 2000, when Paul de Serville’s biography of Boldrewood appeared. The early ‘Port Phillip gentlemen’ and their descendants feared they were in social decline here, as revealed in the novels of H.H. Richardson, Mary Grace Bruce and Martin Boyd. In contrast Irish Catholics did not suffer from such status anxieties. They started at the bottom with no ‘side’ at all and they had nowhere to go but up. They may have complained about sectarianism, but being crippled by nostalgia was arguably worse. The aim of Irish Catholics was not assimilation – that was comparatively easy – but finding a job niche, getting security and improving their position. As so often happens, the most important and obvious desire in people’s lives was never spoken about – in all my research I found only one article on the topic – it was entitled ‘I want my son to get on in the world’. Every issue of The Advocate was full of Catholic success stories, without the paper ever once announcing that this was their primordial drive. Like the character in Molière who finds out he had been speaking prose all his life, Melbourne’s Irish Catholics had been upwardly socially mobile long before they knew what the phrase meant. Fr Bourke’s family history documents an immense network of descendants and relations, including the doctors Fred Colahan and John Billings, the judges Sir Norman O’Bryan and Arthur Adams, and the Galbally family. A small group of Melbourne Irish Catholic families with a love of learning rose up the social scale with astonishing rapidity, with peasant, uneducated parents producing in one generation children who became professionals – doctors, lawyers, priests and politicians. Patrick Morgan has recently published Melbourne Before Mannix; Catholics in Public Life 1880-1920 (Connor Court Publications).